Directed by The Book of Mormon’s, Casey Nicholaw, the new musical comedy has taken the West End by storm. The Prince Edward has been graced with arguably one of the glitziest set designs in London not to mention a cast of stars that seem to shine just as brightly. So, the story goes, Aladdin (played by Dean John-Wilson) is a teenage “street rat” who fell in love with a girl he met in the market place. As the story unfolds it turns out his true love happens to be Princess Jasmine (played by Jade Ewen) of Agrabah, the fictional Indian city, who can only marry a prince. But with the help of an all powerful Genie (Trevor Dion Nicholas) or course with tricks and s little magic, he seals his happy ending. Despite what the production title may suggest, Aladdin really isn’t the star of the show. 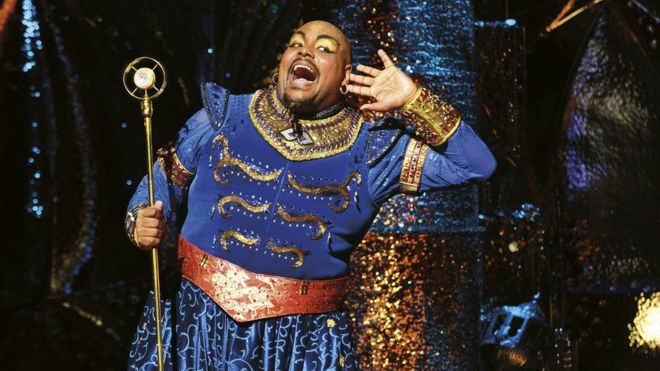 This could be down to character development or likability but Trevor Dion Nicholas’s portrayal of the Genie was definitely the star of the show. He welcomed the audience like guests to his personal show and wowed the crowd with the shows top number, Friend Like Me. After seeing the business and stage filling excitement of Friend Like Me, it didn’t look as though any other songs would be able to top it. But, the cast and orchestra pulled it out of the bag with Prince Ali and romantic number A Whole New World. The stage show also had a handful of numbers that the audience may not have recognized from the Walt Disney animation: Proud of Your Boy, Babkak, Omar, Aladdin, Kassim and High Adventure. All of this had the potential to be ruined, however, with the portrayal of the classics villains, Jafar and his parroting accomplice Iago. Thankfully Don Gallagher and Peter Howe did not disappoint. Gallagher was dressed and made up to mimic the animated version of Jafar voiced by Jonathan Freeman with the curly haired Howe beside him at all times dressed in pink- rather than as a parrot. Over all a glittering performance and comedy gold. The only thing missing was Abu. Disney’s Aladdin will be at the Prince Edward Theatre, London until February 11th 2017.